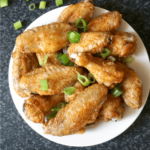 Easy Crispy Oven Baked Chicken Wings with a touch of paprika and garlic, a fantastic appetizer for any big celebration like Game Day or indoor/outdoor parties. A lot better than the fried ones, these wings are absolutely delicious. No, I am not trying to blow my own trumpet, or ok, maybe only a little bit, but seriously, these extra cripsy oven baked chicken wings are baked to perfection! Oh, my! If I could even impress my husband, they must be really good! Well, not sure about impressed, but I took his” oh, yeah, they are really good” like the biggest compliment ever. A big round of applause for me!!! If it funny actually how I rarely bake chicken wings, although they are not only cheap, but also finger-licking good. I did try a few times in restaurant some good chicken wings, but at home I am usually a chicken breast or thighs girl. Now, things have changed, someone is going to be baking loads of chicken wings from now on. Do you know what, once again it was proved that the best flavours come from simple ingredients. A few ugly-looking chicken wings, a bit of salt, a bit of pepper, some garlic powder, a tiny bit of paprika, and ta-daahh: the best appetizer in the world!!! Game day, party, picnic, family gathering, you name it! Chicken wings to the rescue, they are great for every occasion. And, the most important party of the year, the New Year’s Eve party! Surely, you must have a big batch of chicken wings ready! How do you make crispy chicken wings in the oven? Wait, I have not told you about the secret ingredient to get these beauties extra crispy. It’s the plain and boring baking powder. It does sound weird, I know, but trust me, you must use it!!! Chicken wings can be so fatty, I could not believe my eyes that they could release fat taking into account that no oil whatsoever was used to toss them in. So, while the meat itself stays nice and tender, the skin crisps up and becomes so yummy. Does baking powder make chicken wings crispy? Yes, but that’s not all.The oven temperature is also essential. How long to bake wings for and at what temperature? 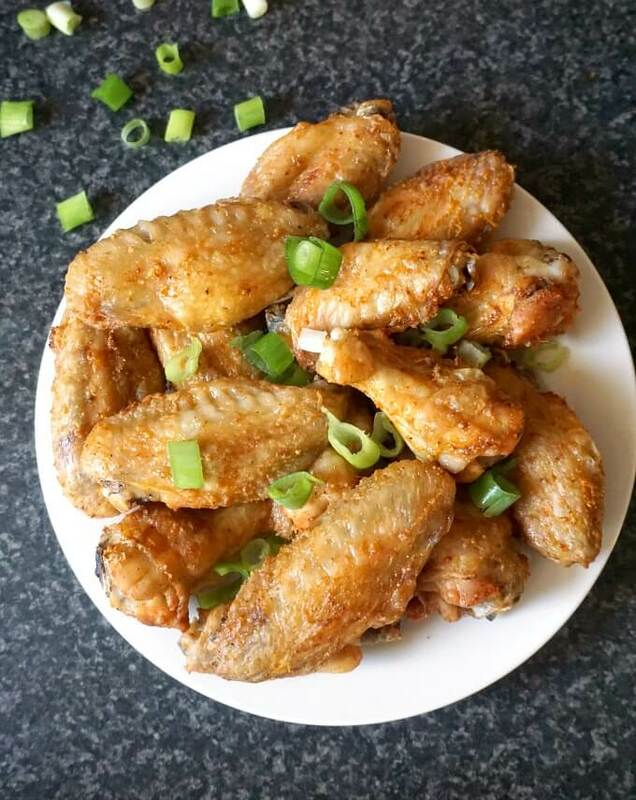 After you coat the chicken wings with the baking powder and seasoning, set the oven at a lower temperature, 150 degrees Celsius (300 degrees Fahrenheit) and bake them first for 30 minutes. The lower temperature will allow the fat to break, and after the 30 minutes, increase the temperature to 220 degrees Celsius (425 degrees Fahrenheit) and bake for a further 35 to 45 minutes until they are beautifully golden and crispy. You do have to turn them on the other side before you increase the temperature, just to make sure they are baked nicely on both sides. Another good idea is to line a baking tray with nonstick paper and place the chicken wings on a rack that goes on top of the tray. 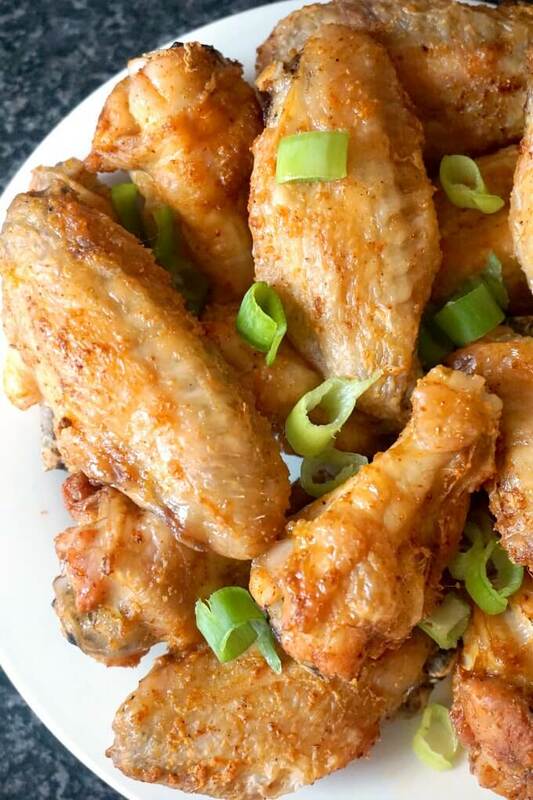 Trust me, you will thank me for that, you really don’t want the oven all messy and smokey from that fat dripping from the wings. Are baked chicken wings healthy? While in most cases I agree that fried food is tasty, these wings actually taste a lot nicer baked. I can’t possibly image them being drenched in a lot of oil, they would be way too greasy and oily. Baking is the right way, it so is! I know, it does take longer, but in the end you will realise the wait was so worth it! So if you want healthy and easy baked chicken wings, you are in the right place. Another recipe that I loved was my Homemade chicken nuggets recipe, where the nuggets had been baked rather than fried. Again, a smashing success! Healthier options are not always boring! 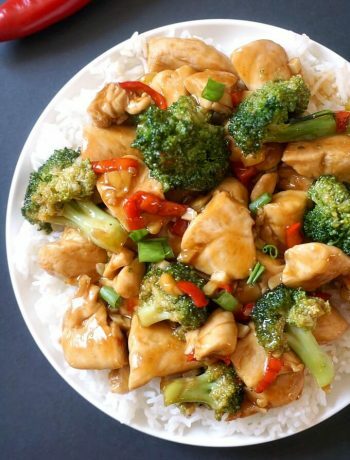 Not at all, healthy recipes can be so delicious and easy to make. Any sauce goes well with these wings, I know many people go for the Buffalo sauce, but I am a simple girl, I prefer the good old ketchup. Don’t get me wrong, they are tasty too without any sauce whatsoever, but you know, just in case. The garlic and paprika can also be left out, just salt and pepper work here too, but I love the kick they get if you do use them. Now, let’s have some extra crispy baked chicken wings with garlic and paprika, they are calling my name! If you’ve tried these HEALTHY CRISPY OVEN BAKED CHICKEN WINGS or any other recipe on the blog then don’t forget to rate the recipe and let me know how you got on in the comments below, I love hearing from you! You can also FOLLOW ME on FACEBOOK, and PINTEREST to see more delicious food and what I’m getting up to. Preheat the oven to 150 degrees Celsius (300 degrees Fahrenheit). Stretch out the chicken wings and cut out the wing tips, then separate the drumette and the vingette. Add the baking powder, salt, pepper, garlic and paprika, seal the bag and give it a good shake so that the chicken pieces can be coated evenly. 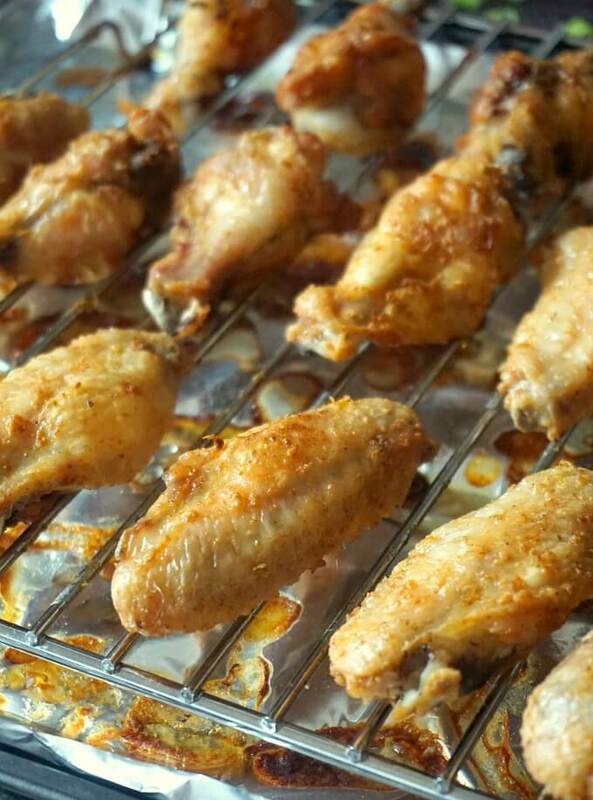 Line a baking tray with nonstick paper, place a rack on top of the tray, then arrange the chicken wings on the rack. Bake for 30 minutes, then remove from the oven and flip the wings on the other side. Increase the temperature to 220 degrees Celsius (425 degrees Fahrenheit) and bake for a further 35 to 45 minutes or until the wings are golden and crispy. Thank you very much! They are delicious indeed, and you are right, chicken wings are not as popular, although they are absolutely delicious. I hope you’ll like the recipe! I truly thought they were deep-fried! How amazing is this! And there is not even oil in the recipe! I am thoroughly impressed! These look amazing!! So perfect for dinner tonight or having friends over. Can’t wait to try it out! I would have never thought about adding baking powder. And they definitely look really crispy and yummy! Great recipe! Oh it’s hard to stop eating them, my husband and l had them in no time. Oh, I agree with you wholeheartedly! Simple recipes most always taste better than any recipe with complicated cooking instructions and/or a long list of ingredients. I love to cook food that is rustic and homestyle. And, your wings look delightfully delicious! OK…I LOVE chicken wings. Baking them is so much better than frying. These sound finger licking good, and the perfect party food. These look incredible. I really thought they were fried and checked twice to see if there was flour in the recipe. Gluten free makes this a win for me! Thabk you, l am sure you will love the wings. These looks really crispy. You are right always simple ingredients makes best meal. I never fan of restaurant dish always prefer homemade or fancy restaurant. I like your secret ingredient baking powder. Next time when make it I will sure remember to add them. Thank you! The baking powder surely helps! I love love love chicken wings! These sound delish! I love the flavor combo! aarrrghhh!! My mouth is watering just looking at these. They look AMAZING! Neat trick about the baking powder! Daniela, i want to thank you so much! these are the best chicken wings! 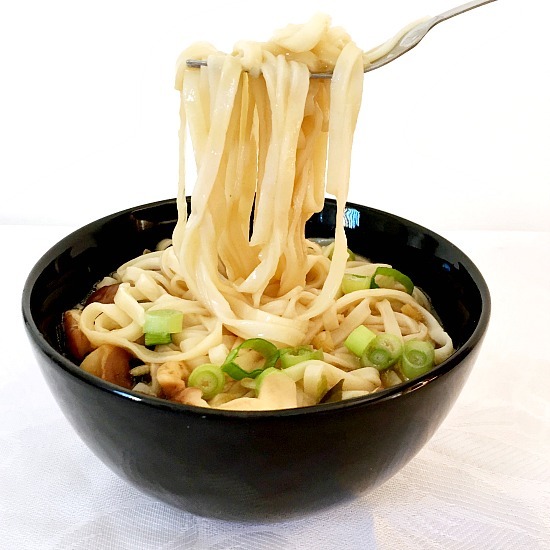 I saved this recipe! Finally healthy wings! Thank you so much, Yulia! I’m so happy that you liked the recipe! I made these recently for a party and they were delicious and a big hit! Do you think I could make these on our gas grill? 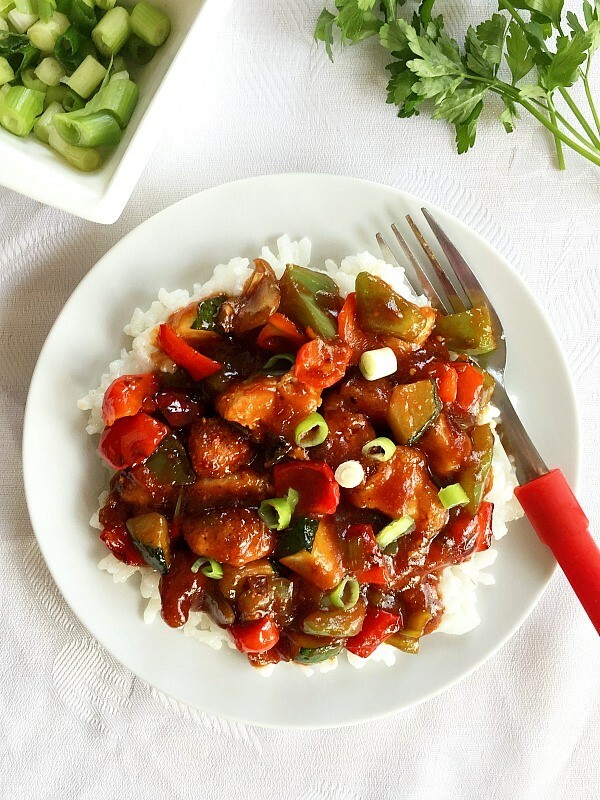 It’s so hot right now I hate to have the oven on but want to make these for dinner! Thank you very much, l am very happy the wings were enjoyed by everyone. I’m afraid l’m not sure if they would work the same way on a gas grill, the timing would be different. I do understand how tough it gets in summer time with the oven on, the kitchen becomes a proper sauna. I was thinking about trying this. Are the racks necessary? Thank you for your comment! The racks are useful as the fat from the wings can drip onto the tray, but if you don’t want to use them, the wings can be placed straight onto a tray. You can just remove the excess fat from the tray. I hope this helps. Hmm hmm tried this and the family love it 👨‍👨‍👧‍👧 we will be doing it again. Thank you. What an amazing treat! I had to take mine out after 35 min at 430. Next time I may spice it up a bit more but loved them as they were. Thank you for your comment, I am happy you enjoyed the recipe. It is one of my favourite, and planning to make some more soon. a big fan of chicken, but I will make these often and refer friends to your recipe….thank you! Who knew about the baking powder! Thank you, Taylor! 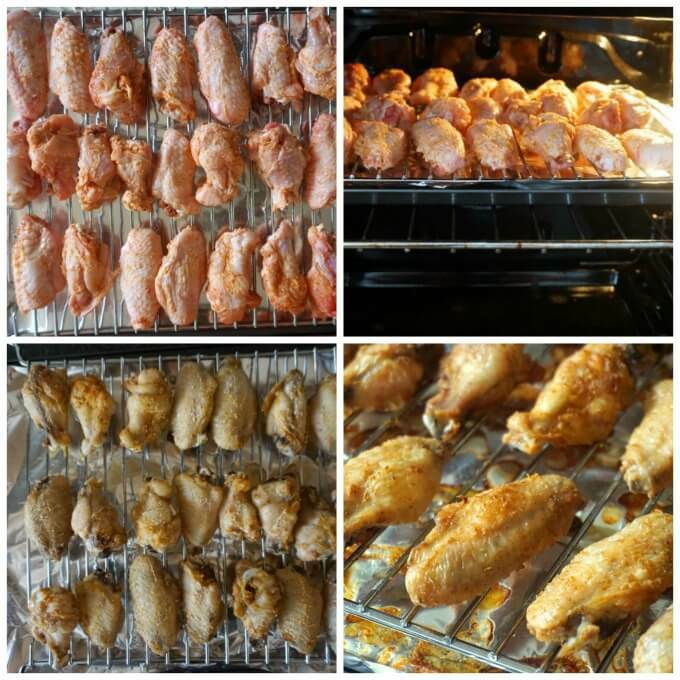 I am very happy that the recipe worked for you too, l absolutely love chicken wings. Simple recipes can sometimes be the best. Made these today and followed the recipe. They are awesome! I did turn them over one more time about 20 minutes after I increased the temp. They are super crispy!